I wanted to try something else to paint so I painted these Vior'la Tau. 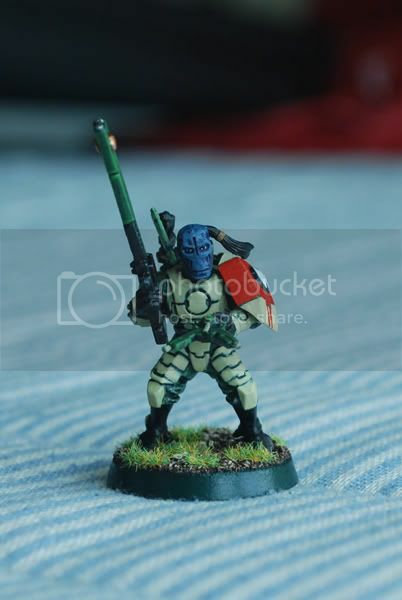 I sorta liked how the Vior'la Tau have been with their warlike status, it all fits perfectly and the colour scheme I seem to like. So here they are, painted and showing right here. Enjoy. 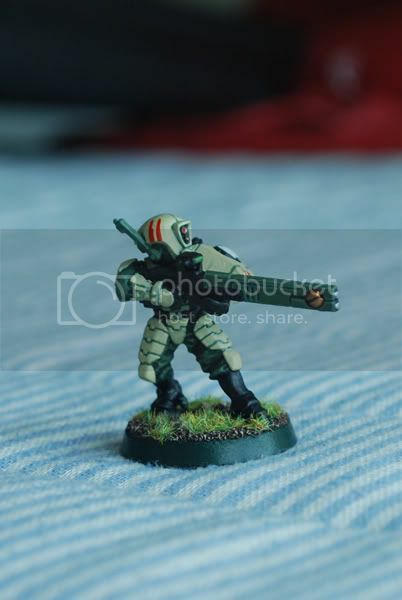 New army I am working on using this paint scheme. still needs some basing but, probably going to go a more woodsy look with sticks, grass and autumn colored lichen. 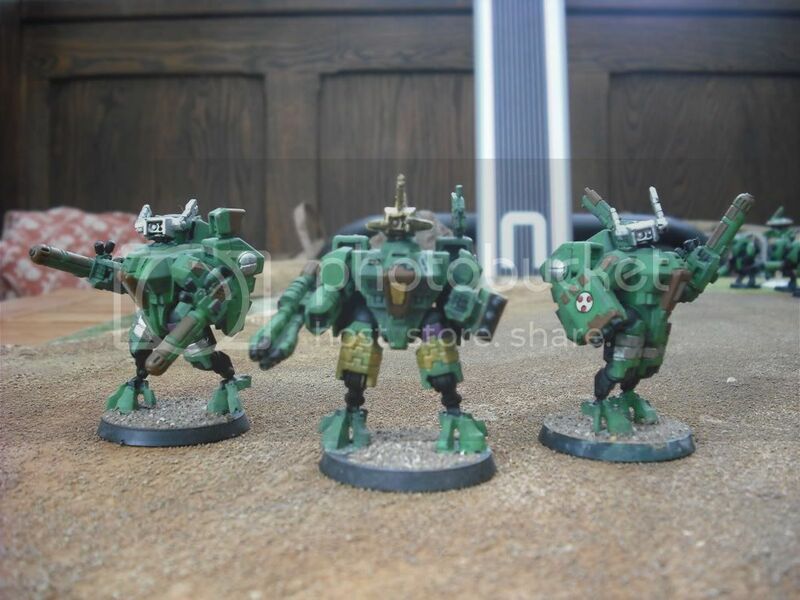 It will be a very battlesuit heavy army and I will post more pics as they come, doing a FW broadside right now. Holy beslubber. So much win, Colonel, so much win. That is a rather nice looking crisis suit good job. 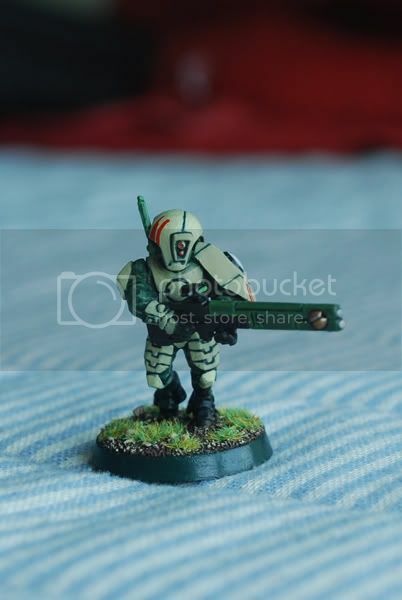 It certainly is a nice scheme, though do you see this transferring over to fire warriors too, or simply holding it onto suits and vehicles!? I would also suggest that the base lets the model down a bit (sorry). It might be interesting to do an autumn themed base, as it might set off a nice complement against the colour scheme... Another idea would be a snow covered base, as it would really make the colour scheme pop! You could still go with an urbanised style, just under heavy snow... having girders and barbed wire and armour plates sticking up through snow might look really interesting!? I don't think I've seen it done before? The FW is a test to see how it came up and the base is still wet from a wash I gave it. I think it came up pretty good, it will be similar on a smaller scale to the suit bases. Death to the carrion lord! 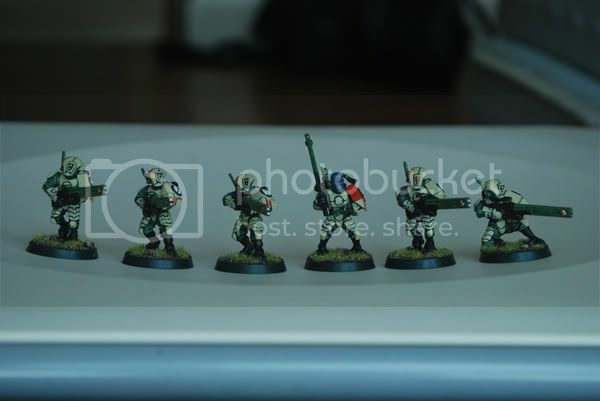 Hi all, Here's a few pics of my Tau force. It's still very much a work in progress but getting there slowly. Well this is my little force. Very rough round the edges but my part for the greater good. Just a few more of my guys I have finished. 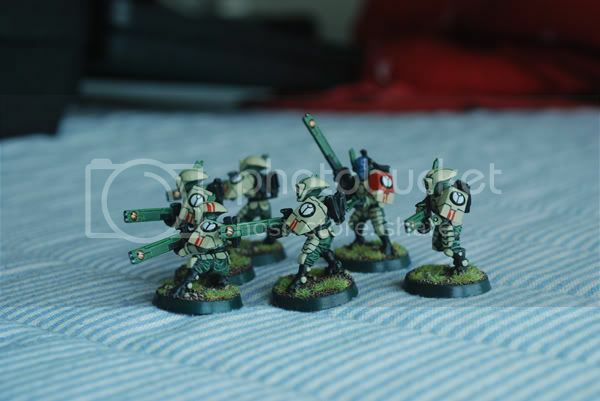 I first dabbled with Tau about 5 years ago, and painted them in dark reds and browns, but then work got in the way of all my hobbies, so they went into storage for a while. 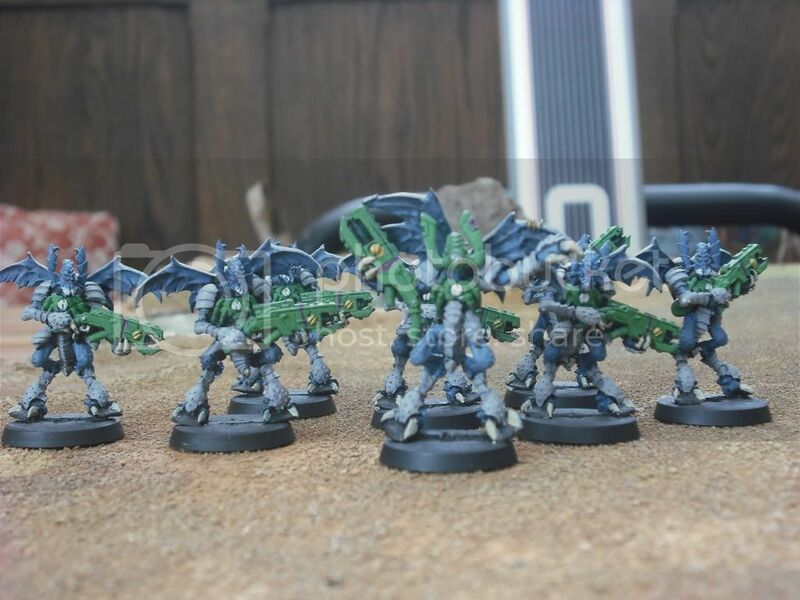 When I got back into GW, I went to my Dark Eldar first (shortly before the new codex was released - got my timing just right) and painted them all in dark red and chainmail, so when I had another look at my Tau I wanted to try something different. 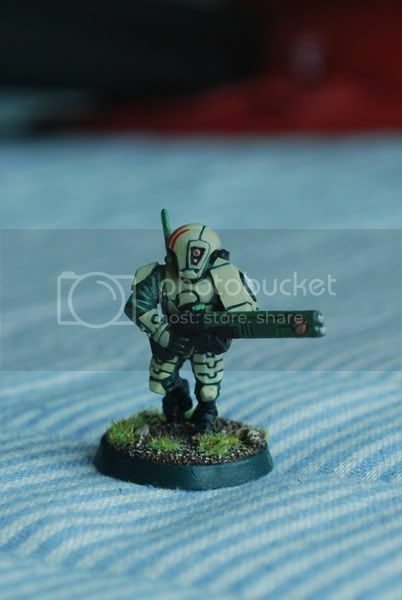 I bit of advice from the painting forum here showed me how to strip the paint off so that I could start again, and I chose a scheme based on the Bork'an example from the Codex. This is about 40% of the Tau minis that I have and I need to buy a further 750pts if I'm indeed going to enter them in the 40ko UK tournament this year. I'll keep posting new ones on my Flickr page as they're done if anyone is interested in monitoring my progress. Huge fan of the Bork'an sept and these models look great! Must say, i really like the stealth suits, with just the contrast from the glowing eyes, very stealthy. On the whole a well painted force, can't wait to see a full 1500 point army laid out on a table!! These look great. There is a great attention to detail, from the squad markings down to the drone designation markings! It is final touches like that which really help to bring the models to life, and is something that my own forces are currently lacking (though I'm trying to rectify that). I've seen your Avatar pic and was eager to see more so thanks for sharing!! 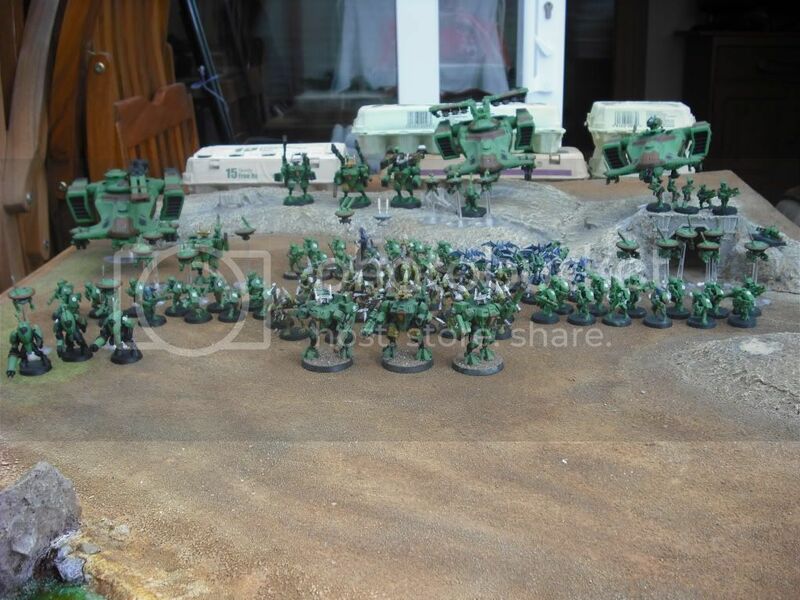 I'd love to see how this army progresses and grows! Thanks very much. I put it down to being a perfectionist - I don't like to move on to another model until the previous one is finished, and the details give me the great chance to make them individual. 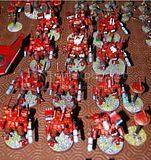 I think I might have to change my tactics though if I don't want to turn up at the tournament with a half-painted army. Time to bite the bullet and apply the 80:20 principle ... And promise myself I'll fill in the details later. I would like to present the Ka'rashi Lissera, aka The Exiled Union. 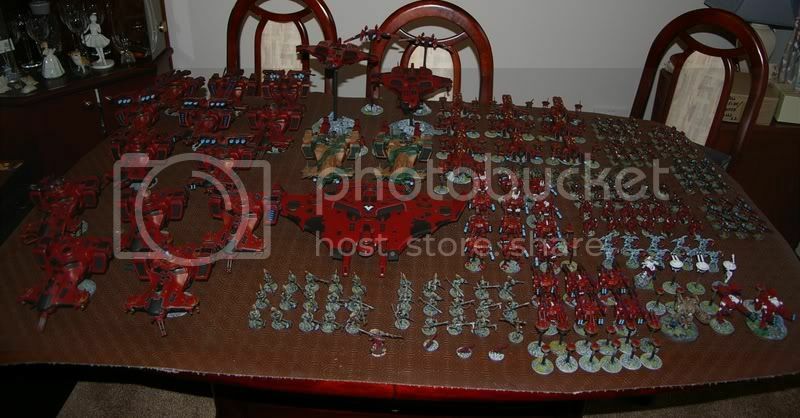 This was an army of 10,500pts for an Apocalypse game about 3 years ago, and is about 70% of my entire Tau forces. Some closer shots: these are thumbnails, so please click on them to see a larger image. I will hopefully eventually get all the models built and painted, but I reckon I have at least 4000pts more to do, if not a bit more than that. 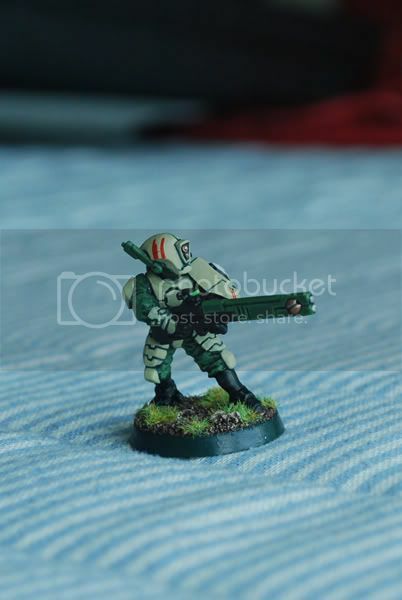 May I present the Tau of Mey'sha. I created Mey'sha as a forest satellite (Moon for you non astronomy people) of Tau'n. GW tell us very little about the Tau planets and thus I feel fine in creating this. 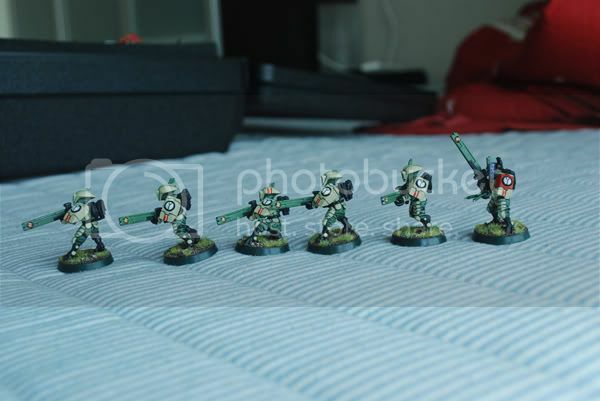 In my battlesuit squads the leader has Gold helmets and stripes wilst the other members have silver. No they aren't dancing. The green and Brown camo suits the flora on the forest satellite. 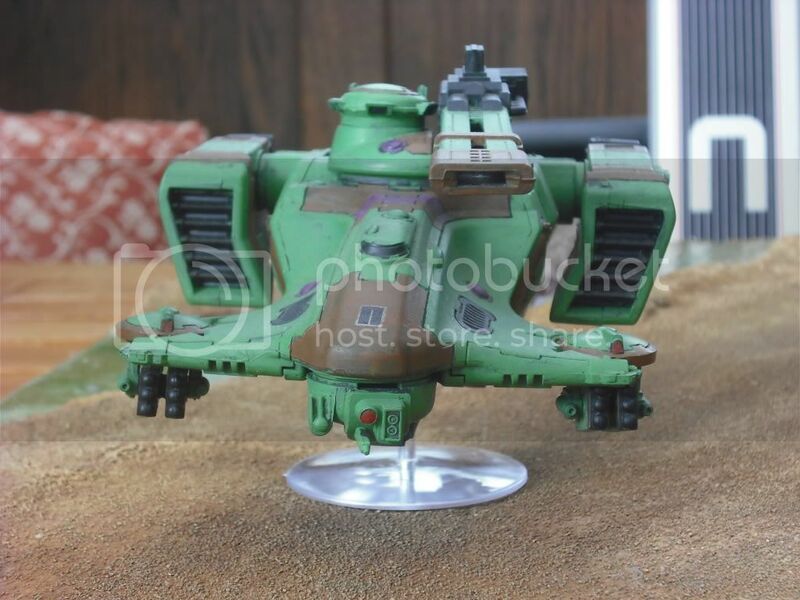 As GW haven't offically designated a sept colour to Tau'n I have used purple. (I even asked them and got the reply of: For unspecified sept colours use whatever you want.) I know that DOW had a yellow for Tau'n but I don't think THQ has the authority to tell me that. If I have to repaint a stipe here and there in the future then I don't really mind. Sorry for poor quality on painting, I try my best. There is still plenty to add to this army. So, this is what I managed to scrape together for the 40ko tournament yesterday. 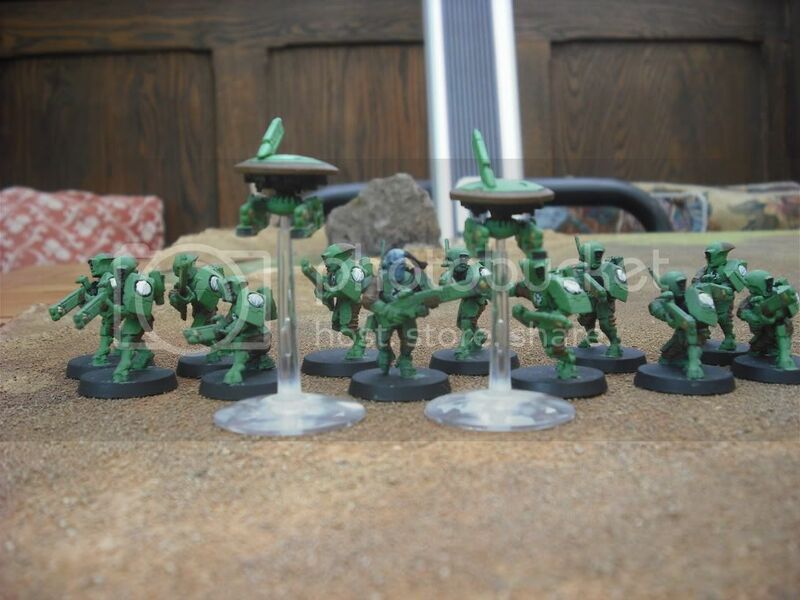 This 1750pt list consists of every Tau model I own (except for 1 marker drone) all painted with a day to spare! Detailed shots are available on Flickr, through the link in my sig. I encourage people to check out the detailed shots! 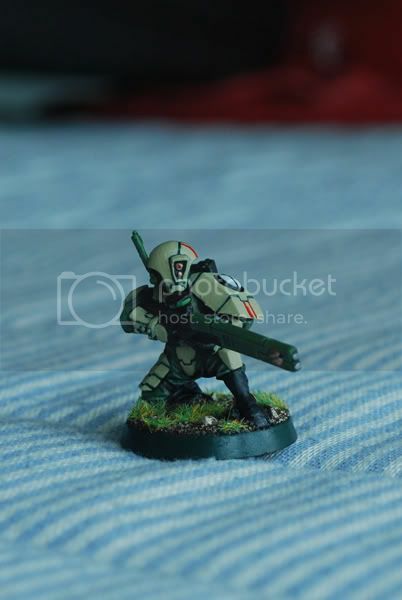 Armies: Tau, Black Templar, Imperial Guard. dprevs I like your white/red color scheme. I've done a few of my models in a white/black(stormtrooper) color scheme a long time ago, they looked cool but rather meh. Your White/Red combo I think would look pretty cool on a whole army. I'll have to steal it for my farsight enclave colors. Rest of my army is painted in the traditional vommit brown colors. I'll post pics soon.